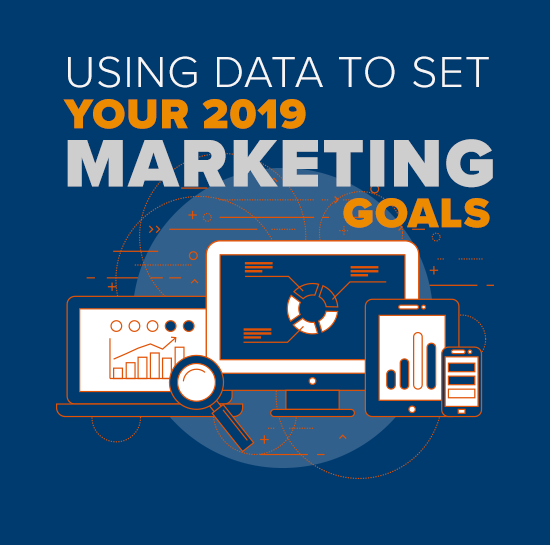 Have you written your marketing strategy for 2019? “Marketers who document strategy are 538% more likely to report success than those who don’t” (Business2Community, 2018). That is huge! And luckily, we have a great resource for writing a successful strategy. It is time to put the data you have been collecting all year to work for you. Filtering and analyzing this data should have a big influence on your marketing strategy for the coming year. If you’re new to data and analytics, the prospect of filtering and analyzing all this data can be overwhelming. Fear not; we are here to help. We’ll show you how to use data to see patterns and trends in your website visitors to give them a better experience and convert the traffic into leads. Let’s start with your website data. One of the most popular tools out there is Google Analytics. Google Analytics provides valuable information from site visitors, like how visitors came to your site, their demographic info, their behavior & activity. Here’s an example. Let’s assume you have a service website, such as one a financial planner would have. 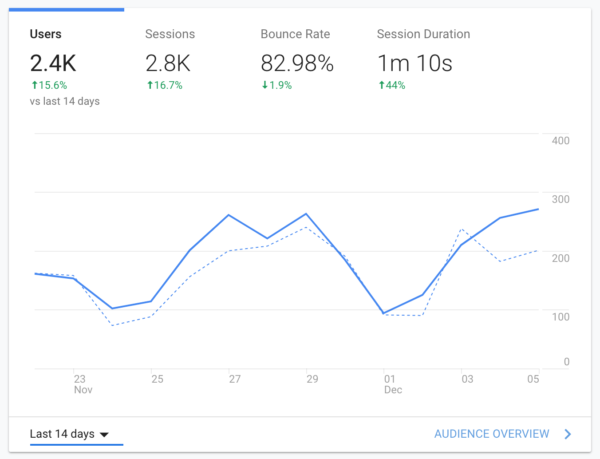 Google Analytics might show that you had 3,500 site visits in the past 30 days and that 40% of those visitors accessed your site from mobile devices. Analytics also revealed that visitors using phones are 30% MORE likely to contact you. How is this helpful? The data shows the importance of optimization of your site for mobile users and voice search. You would want to include a mobile site audit for your website as part of your marketing strategy. This would include making sure forms have autofill options, phone numbers are “click to call” and you have used structured data to optimize for voice search. You would also research keywords and terms people use when asking Siri, Cortana, Google Assist, or Alexa (voice search) on their mobile devices. Before we go any further, let’s talk about goals. Marketers who set goals are 429% more likely to report success than those who don’t, and 81% of those successful, goal-setting marketers achieve them (Behance, 2018). Every marketing plan should include SMART goals. (To make a goal S.M.A.R.T., it needs to conform to the following criteria: Specific, Measurable, Attainable, Relevant and Timely). This framework allows you to think about the stages of a business’s relationship or engagement with customers. Move customers through these phases with the answers to these questions. Is the goal specific and detailed? Can you track this goal? How will you measure it? How will you know when you’ve accomplished it? Is this goal realistically attainable? Will this goal help you reach your business goals? Is it relevant to your business? When do you want to achieve this goal? Set a time-frame. Reach – bringing customers to your site through various methods like content marketing, ads, organic search, social media, and offline promotions. What is the data from last year showing you about your reach? What successfully brought visitors to your site? Where can you improve? Once you have reached your customers, you need to keep them Engaged. Can they find what they were looking for? Does your site lead the visitor where you want them to go? Calls to actions are important for this stage and the conversion stage. Use data to see what visitors engaged with most often and what did they do after an engagement. Use this to tweak and improve your content. Conversions – once engaged you need to Convert them. What do you want them to do on your website? For example, do you want them to sign up for a newsletter, watch a video (using videos on landing pages will increase conversions by 86%), download information, submit a contact form, or purchase something (Hubspot, 2018). These can also be your goals. Looking at where customers dropped off your site can be helpful for conversion tweaks. Use data to see where visitors left your site and audit those pages – add calls to actions or buttons to lead them to convert. Ultimately, you want to Sustain a long-term relationship. How will you encourage them to return to the site? What new content will you be adding and how often. Will you be offering an awards program, sending discounts, etc. Content marketing gets three times more leads than paid search advertising (Hubspot, 2018). The data showing what your visitors engaged with previously will be a great indicator of what they are looking for and help you plan for future content.